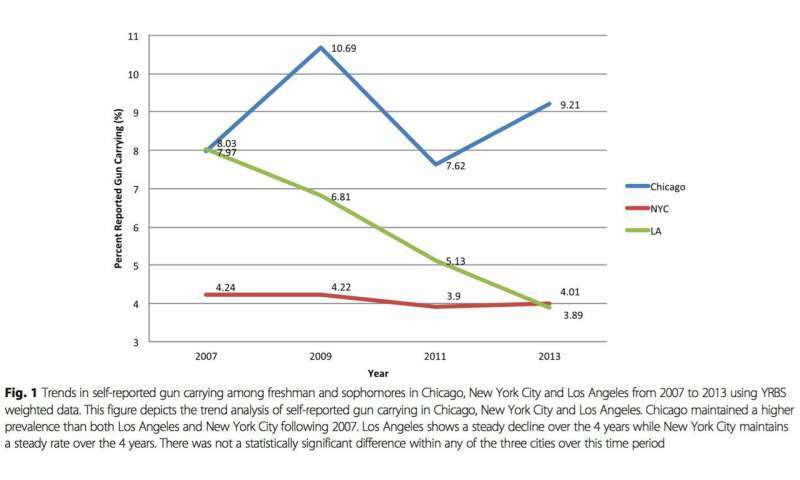 More students report carrying guns in Chicago than in New York or Los Angeles, a new Northwestern Medicine study shows. The findings provide historical background for Chicago's 2016 spike in gun violence, which occurred mostly among youth and young adults. When students were exposed to more violence risk factors, such as feeling unsafe in school, being exposed to fights or doing illegal drugs, they were more likely to carry a gun, the study found. Chicago's students were exposed to more guns and these risk factors between 2007 and 2013 than their peers in New York and LA. The authors hypothesize Chicago students between the ages of 14 and 16 who were carrying guns in 2013 were likely involved in Chicago's gun violence in 2016 and 2017. "Our findings suggest that there is a clear link between the increase in Chicago students carrying guns in 2013 and the city's spike in gun violence in 2016," said senior author Joseph Feinglass, professor of general internal medicine, geriatrics and preventive medicine at Feinberg. "The city was fertile ground for this increase in shootings." "It's not hard to imagine why more students in Chicago carry guns than the other two cities with significant violence and homicide burden," said co-author Dr. Karen Sheehan, professor of pediatrics and preventive medicine at Northwestern University Feinberg School of Medicine and a physician at Ann & Robert H. Lurie Children's Hospital of Chicago. "Kids in Chicago are experiencing multiple layers of violence and fear of violence in school on a daily basis." "Our findings highlight the ongoing need to address Chicago's concentrated poverty and unemployment problems, its extreme levels of racial and ethnic segregation and the hopelessness and isolation so many young people feel," Feinglass said. Of all the countries in the OECD, first world countries or modern western countries, only the USA allows students to carry weapons of any kind and guns in particular. Some third world, middle eastern and Muslim countries have gun laws and culture similar to the USA.